▲ Worried about dishonest employees? ▲ Are they revealing confidential info? ▲ Are they lying about their actual location? 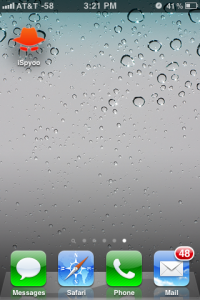 iSpyoo Spy iPhone is the leading spy software for the iPhone, iPad and iPod. For anyone who wants to monitor text messages, call information and GPS locations of their Apple iPhone in complete stealth, this software does the job. The phone must have a data plan & an Internet connection so the iSpyoo software can upload logs to your account. iSpyoo Spy iPhone is the world’s first and best iPhone spy software! Step 1: Launch Cydia application from your device. From your Springboard of device which phone you want to track, find icon Cydia and tap to launch it. From Cydia screen, click Manage -> Source -> Edit -> Add and enter http://iphone.iSpyoo.com and then click Add Source. If you entered the correct URL, verification and updating sources process will start. Wait for the URL verification and updating sources processes to finish. Step 3: Choose package iSpyoo from source to install. After sllecting Return to Cydia after downloading is complete will take you back to the Sources screen. Once you are here, select iSpyoo to see package iSpyoo (Find out the truth with cell phone). When you tap the package, you will see Install button, click it and click Complete button to complete this installation. If the device asks you to Restart Springboard and you are asked about passcode, then you should enter a secret passcode: 2013 to bypass. Remember that this default passcode is available for short time, or when the device still shows iSpyoo icon on Springboard. If not (you have hided icon iSpyoo), the passcode is not available any more. 2) create the account on your target phone. This method will authenticate for you (no need to do an action login). Tips: Do again with second or third devices if you want to track more device in the same account. Each account you can add 3 devices. Blog and discuss about installation. For example install a spyware remotely (without keep in hand physically the target phone). At iSpyoo, we want to make sure you are getting top-notch service. If you have any kind of problems during installation, feel free to contact our customer support reps who are happy to help you any time. Click Contact Us and the click Contact Form to give us your requests. Many thanks. VERIZON NOTICE: If your carrier is Verizon, you MUST currently subscribe to their GPS services so that the GPS tracking feature of Mobile Spy will function properly. If you do not subscribe to their GPS services,iSpyoo will NOT be able to monitor the GPS locations of the monitored device. iSpyoo is now fully compatible with Android tablets running OS 2.2 and up! Website history, Photos & Videos (taken by the phone), Profanity Alert, Intrusion Alert, Custom Keyword Alert, Contact Alert, Geo-Fencing Alert, SMS Command Capability, Contact lists, Gmail, Primary E-mail inbox, YouTube Videos, Auto Update, Facebook Messenger, WhatsApp Messenger, Bookmarks (Safari), Daily or Weekly New Logs Statistics, Recovery (Lock, Wipe Data, GPS), Calendar Events, Memo Logs, Apps Installed, Block Apps, Get Logs Emailed, Text messages - iPhone Only, iMessages, Call logs - iPhone Only, GPS locations, Record Surroundings, Stealth Camera. I caught my employee cheating and sharing our client lists with competitors. Thanks to iSpyoo, I had emails, BBM conversations and meeting records plus I knew exactly whom they were visiting and when due to iSpyoo's cell phone tracking capabilities. You never truly understand the meaning of the word "worry" until you become a parent. Our kids think that they are adults and can do whatever they want - I want to believe they are mature, but their actions only bring doub. iSpyoo is designed for monitoring your children, employees or others on a smartphone or mobile device that you own or have proper consent to monitor. You are required to notify users of the device that they are being monitored. iSpyoo app is designed for ethical monitoring for parents who wish to monitor their underage children or for employers who wish to monitor their employees with their written consent. The buyer of the iSpyoo app must own the smartphone or must have written consent from their children or employees granting them permission to monitor before they install and activate the iSpyoo app onto the smartphone.